This intimate package for two is available seasonally at our outdoor fountain area located along the waters’ edge of the ship. 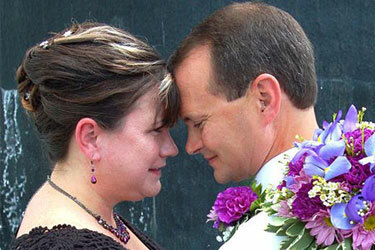 The cost for this wedding package is $450.00 (Plus Tax). This package is available seasonally at our outdoor fountain area located along the waters’ edge of the ship for Bride, Groom and up to ten guests. One Hour Rental for Bride, Groom and up to 10 guests at our outdoor fountain area located along the waters’ edge of the ship. The cost for this wedding package is $1,225.00 (Plus Tax). This package is available Pre Museum Opening Hours – 8am to 9am on the Titanic Grand Staircase for Bride, Groom and up to twenty-five guests. 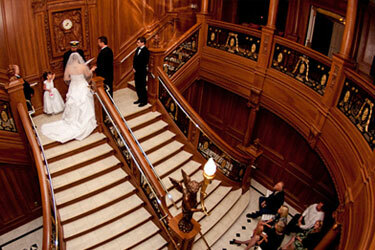 One Hour Rental at the Titanic Grand Staircase for Bride & Groom and seating for up to 25 guests. The cost for this wedding package is $1850.00 (Plus Tax). Additional guests may be added at an additional cost per person. 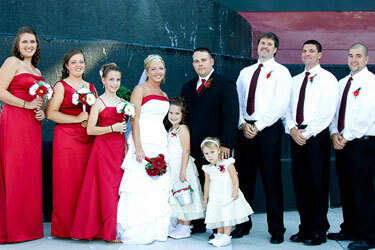 Private Wedding Ceremony and Receptions for 100 or more guests are available upon request. Pricing is based on the date of your ceremony, catering, and the length of rental. The above packages are based on availability. Prices listed are valid if booked in the current calendar year. We require a signed contract and a non-refundable deposit to hold your date. The final balance is due 30 days prior to your date. We are excited to offer this landmark attraction for your special day. Please feel free to contact me with any questions or for additional information. 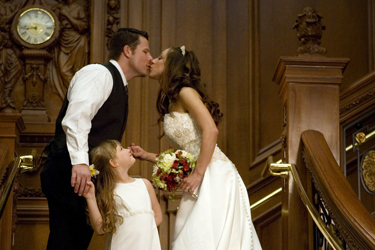 I look forward to working with you to make your wedding at the Titanic exciting, unique and romantic. Non-Refundable Deposit due with signed contract to book date for Private Events and Weddings (Private Event Rental Deposit $500/Wedding Deposit $250). Final payment and counts due 30 days prior to event date. Cancellation Deadline – 30 days prior to arrival date (Penalty of 25% if cancelled within 30 days prior to event date). This quote is valid for 30 days from the proposal date listed above. Titanic may use photo taken at events, weddings, vow renewals and are subject for display, publication and advertising use under this agreement.